Aft view of PL-12 / SD-10A on display at Zhuhai 2008 (image © 2009, Zhenguan Studio). The PLA-AF and PLA-N operate a diverse mix of indigenously manufactured and imported Russian Air to Air Missiles (AAM), carried by a no less diverse fleet of combat aircraft. While imported Russian R-27 / AA-10 Alamo, R-73 / AA-11 Archer and R-77 / AA-12 Adder AAMs are primarily used with the imported Russian built Su-27SK / J-11A and Su-30MKK/MK3 Flankers, indigenous Chinese built weapons are dominant across the Chinese built fleets of J-10A/S Sinocanard, J-11B Sino-Flanker, J-8 Finback, J-7 Fishbed, J-6 Farmer, A-5/Q-5 Fantan, and JH-7 Flying Leopard. 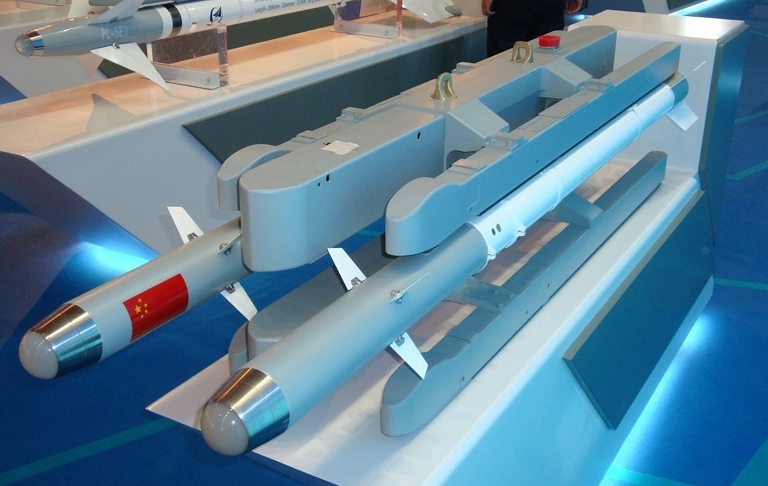 China manufactures only two Beyond Visual Range (BVR) guided AAMs, the active radar guided PL-12/SD-10 “Sino-AMRAAM” and a reverse engineered semi-active radar guided Selenia Aspide Mk.1, designated the PL-11. A much more diverse inventory of heatseeking short range weapons exists. 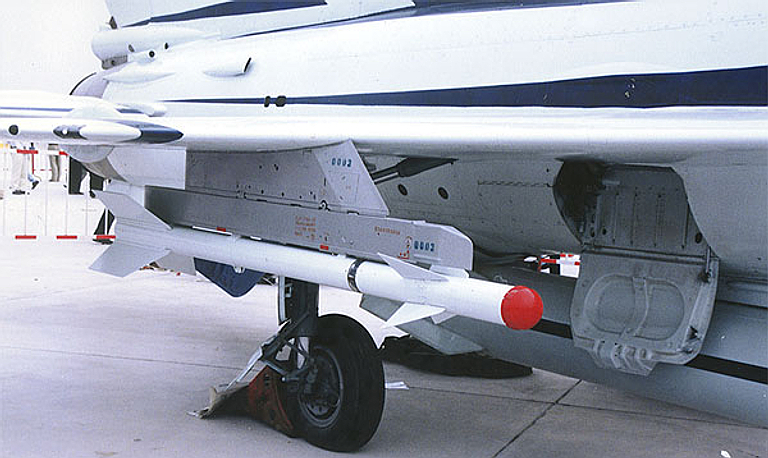 These include analogues or derivatives of a range of Western missiles, such as the AIM-9 family and Rafael Python 3 series, and uniquely Chinese developments such as the TY-90, designed for air combat between helicopters. Most Chinese built AAMs have been adapted for use as SAMs, either land based, naval, or both. Most are also being offered widely for export. In perspective, the unpalatable reality of this decade is that Australia's RAAF faces a genuine 'rainbow threat' environment across the wider region. The sheer diversity of missile types in service or being introduced, be they of US, Russian, EU, Israeli or Chinese origin, and the prospect of evolving regional clone variants and derivatives, presents a genuine long term problem in intelligence gathering, analysis and countermeasures library maintenance. Two key issues have arisen during this decade. The first is the large scale export of advanced variants of the Russian R-74, R-27 and R-77, arming MiG and Sukhoi fighters. These weapons are highly competitive against US and EU sourced AAMs operated by the RAAF, and can be expected to further evolve over time. With diverse mixes of seeker types in the BVR missiles, defending against them will present real challenges. A robust apporach will require investment in training, including simulation, tactics development, and adequate electronic and infrared countermeasures on RAAF aircraft. none of these considerations have been addressed to date in existing or planned RAAF aircraft. The second issue to arise is the future export of very long range 'AWACS killer' missiles, which are the poor man's equaliser against an opponent with an advantage in AEW&C capabilities. Much of the current force structure plan is predicated on the RAAF holding an assymetric advantage in AEW&C capability over any opponent, indefinitely. Missiles such as the R-172 and R-37 allow any Sukhoi operator to threaten an opposing AEW&C aircraft from a safe distance. There can be no doubt that a future RAAF force structure will have to be planned around missile capabilities now developing across the region, and compromises are simply not an option in the long term. 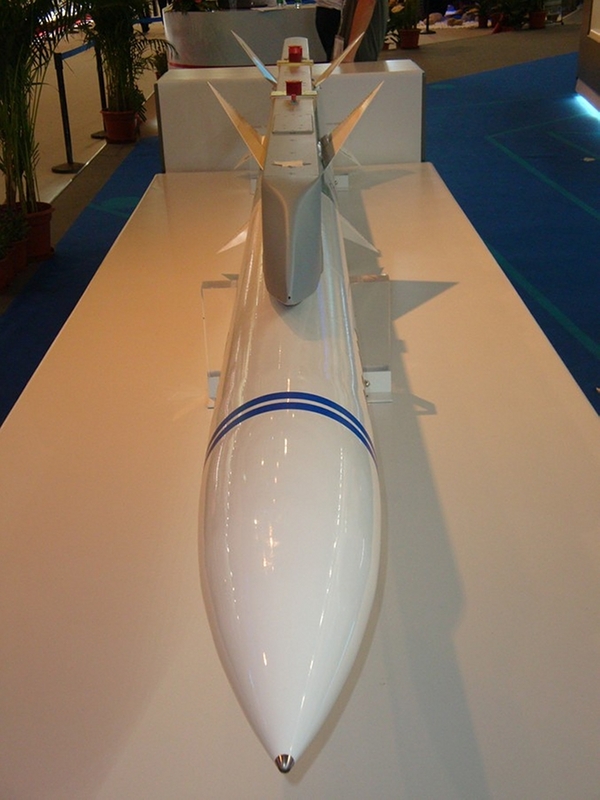 In 2008 an image appeared on the Chinese internet showing a solid ramjet powered AAM evidently based on the existing PL-12 design. The status of this design is not clear. Conceptually it is closest to the MBDA Meteor AAM planned for the Royal Air Force. If such a missile is in development it would likely be similar in performance to the Meteor, which has exceptionally high endgame lethality due to the increased sustained G capability arising from persistent engine thrust, compared to conventional single and dual pulse rocket AAMs. 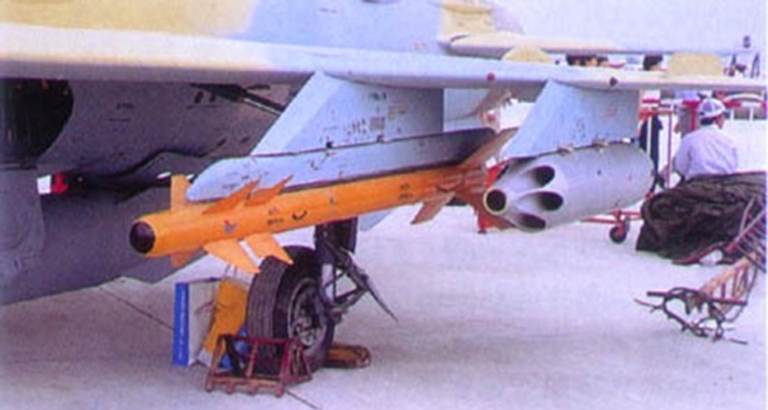 China's indigenous equivalent to the AMRAAM is the PL-12/SD-10, claimed to use the seeker and other components from the Russian R-77 AMRAAM-ski. Credited with competitive performance against the AMRAAM, the PL-12 is expected to be deployed on the Su-27, Su-30, J-10 (image © 2009, Zhenguan Studio). 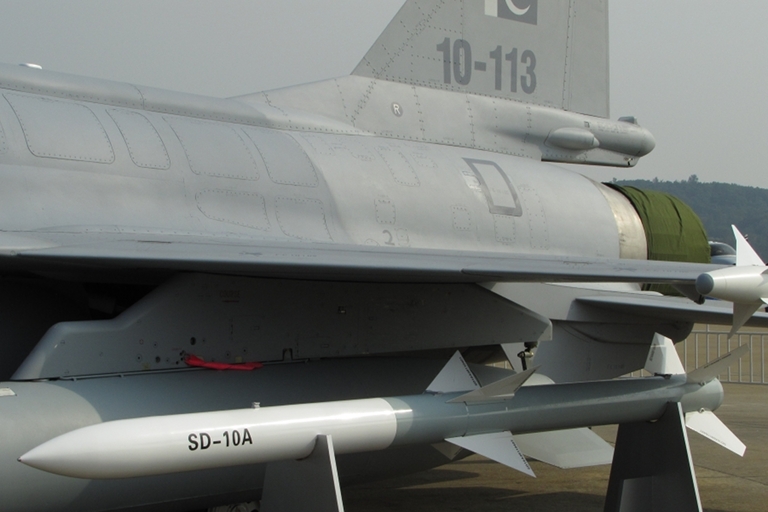 While some confusion remains about designations, most sources identify the SD-10 and PL-12 as the same missile, China's equivalent to the AMRAAM. 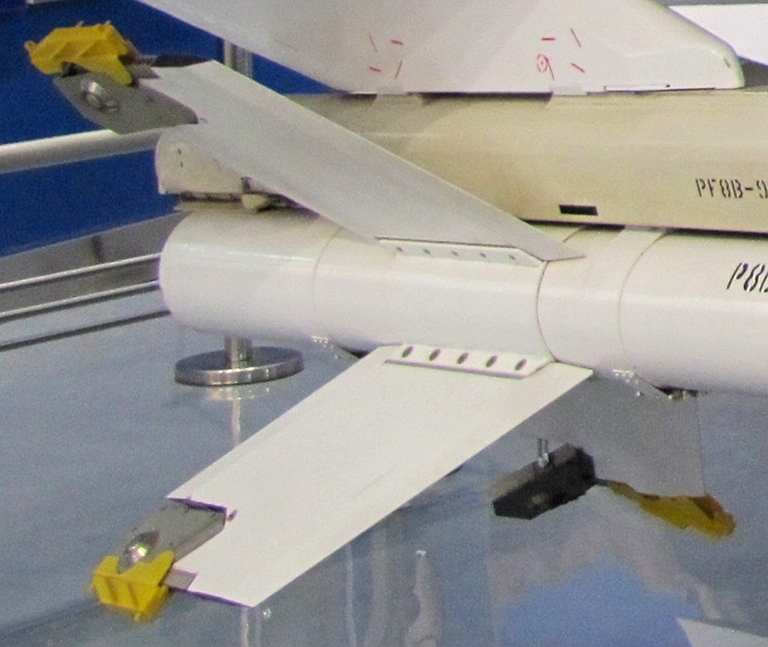 This weapon is in sizing and configuration very similar to the AIM-120A, but employs a unique tail planform. 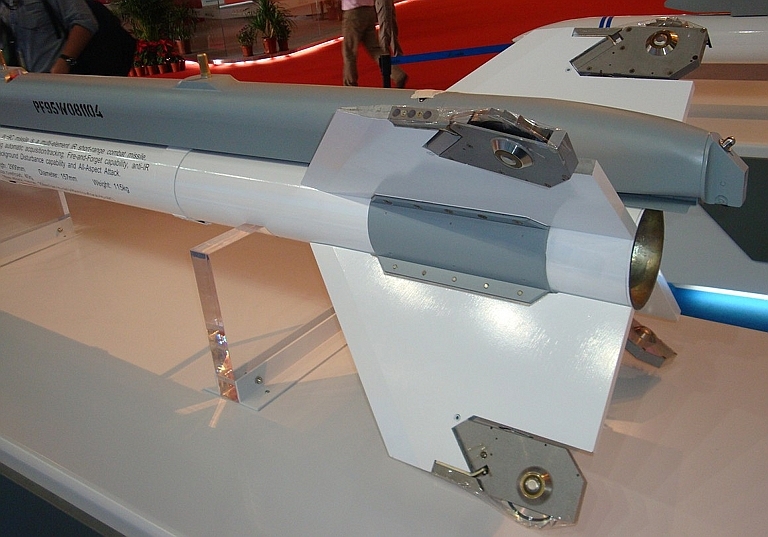 Equipped with an active radar seeker, and datalink aided inertial midcourse guidance, this missile is a credible player against the AMRAAM and R-77 series. 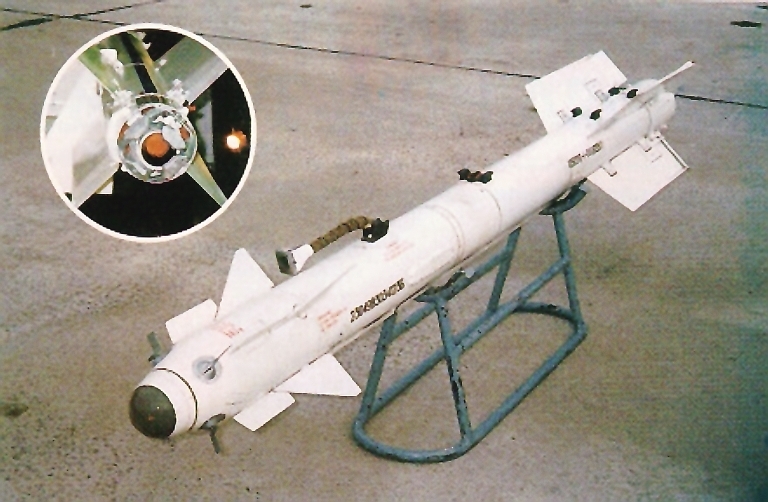 The indigenous AMR-1 active seeker is identified with the PL-12, and numerous reports exist claiming that it is a derivative of the Russian Agat 9B-1348E seeker package used in the R-77 series. The missile is widely credited with superior range performance to the AIM-120A-C variants. There is little doubt that the PL-12 closes most of the technology gap between Chinese built BVR missiles, and in service Western BVR missiles. Luoyang PL-12/SD-10A JF-17 display, exported to Pakistan (image © 2010 Air Power Australia, via Zhenguan Studio). 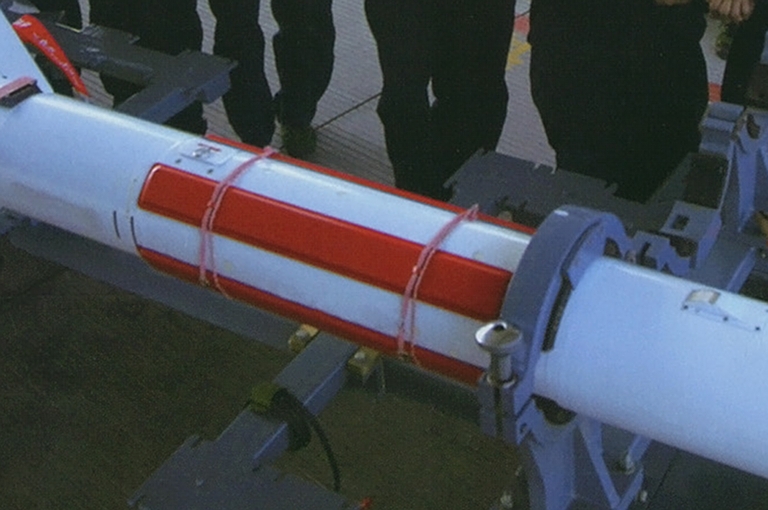 Above, below: Luoyang PL-12/SD-10A on JF-17 pylon launchers, exported to Pakistan (image © 2010 Air Power Australia, via Zhenguan Studio). 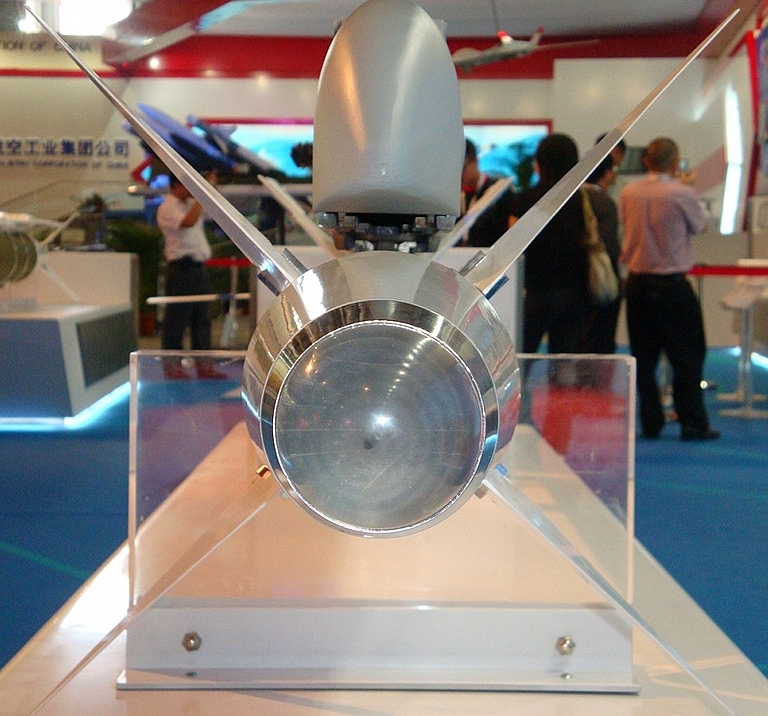 Radome of PL-12 / SD-10A on display at Zhuhai 2008 (image © 2009, Zhenguan Studio). 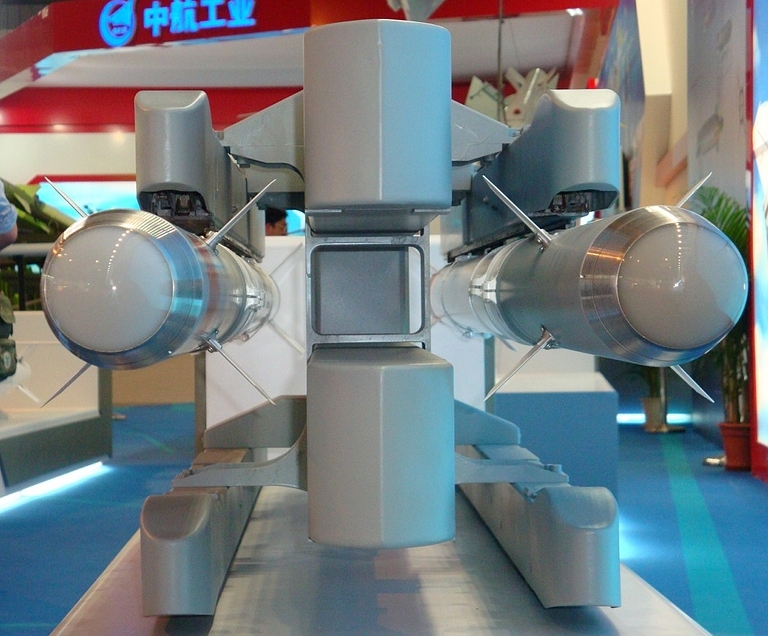 Tail section of PL-12 / SD-10A on display at Zhuhai 2008 (image © 2009, Zhenguan Studio). PL-12 / SD-10A on display at Datangshan in 2010 (Zhenguan Studio, © 2010, Air Power Australia). PL-12 / SD-10A being loaded on PLA-N J-8F Finback D fighter (Chinese Internet). Detail of RF proximity fuse antennas on PL-12 / SD-10A (Zhenguan Studio, © 2010, Air Power Australia). Detail of RF proximity fuse antennas with protective covers fitted on PL-12 / SD-10A (Chinese Internet). This illustration of the PL-ASR, also labelled the PL-10, emerged on a Chinese internet site during 2008. The weapon is claimed to include a Lock On After Launch (LOAL) capability, suggesting a high performance strapdown inertial midcourse package in the guidance section. The design includes coupled TVC vanes and tail controls to permit over the shoulder shots, intended for use with a Helmet Mounted Sight or Display. 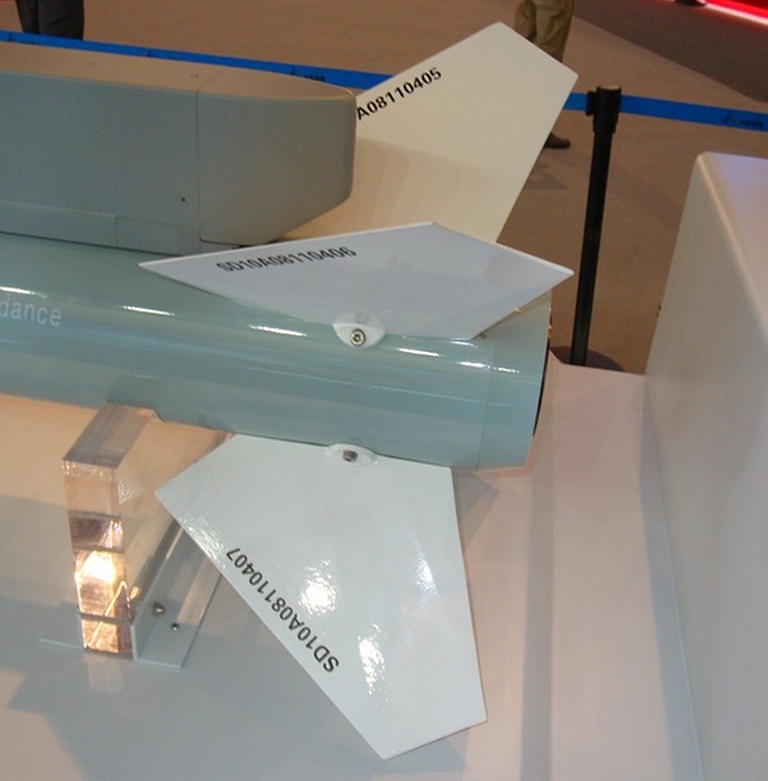 Conceptually the missile appears closest to the joint South African - Brazilian Denel A-Darter. The PL-11 was the first Chinese built radar guided AAM to be deployed in large numbers. The design is a direct derivative of the monopulse semi-active homing Aspide Mk.1 carried by Italian F-104S Starfighters, both of the latter systems now retired. While it is known that Selenia withdrew support for the Aspide licence following 1989, the PL-11 was nevertheless deployed in the 1990s, on the indigenous J-8B Finback. 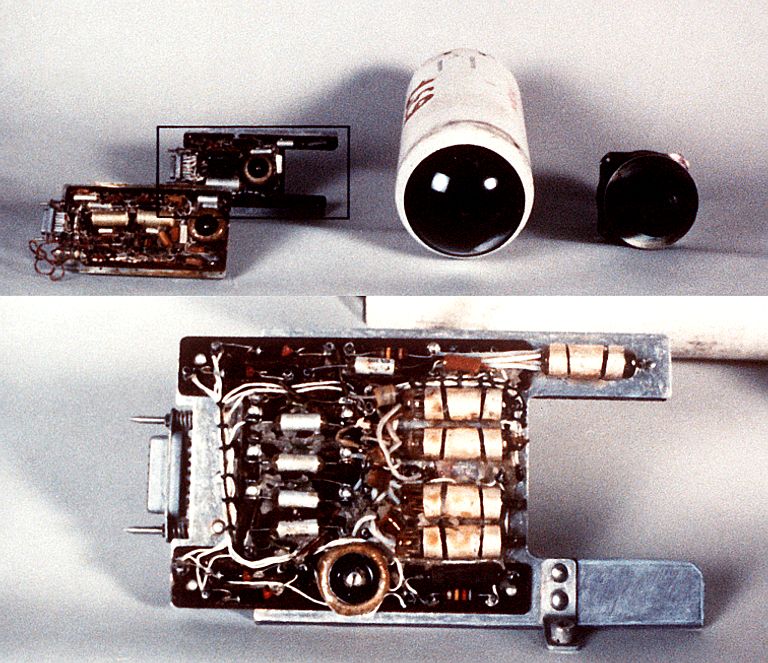 Three variants are cited, the basic semi-active homing PL-11 equivalent to an Aspide Mk.1, the improved PL-11A with more range and a midcourse inertial unit permitting terminal phase only illumination, and the PL-11B or PL-11AMR, claimed to be equipped with an active radar seeker and equivalent to the defunct UK BAe Active Skyflash or Aspide Mk.2 - both AIM-7 derivatives. The export variant is designated the FD-60. 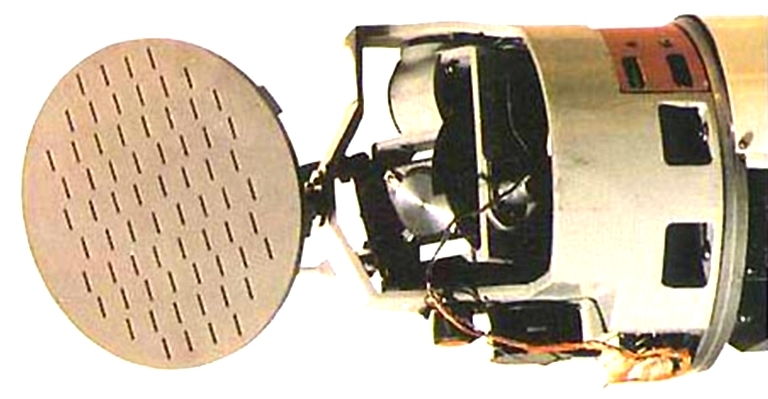 AMR-1 monopulse active radar homing seeker developed for the PL-11B. 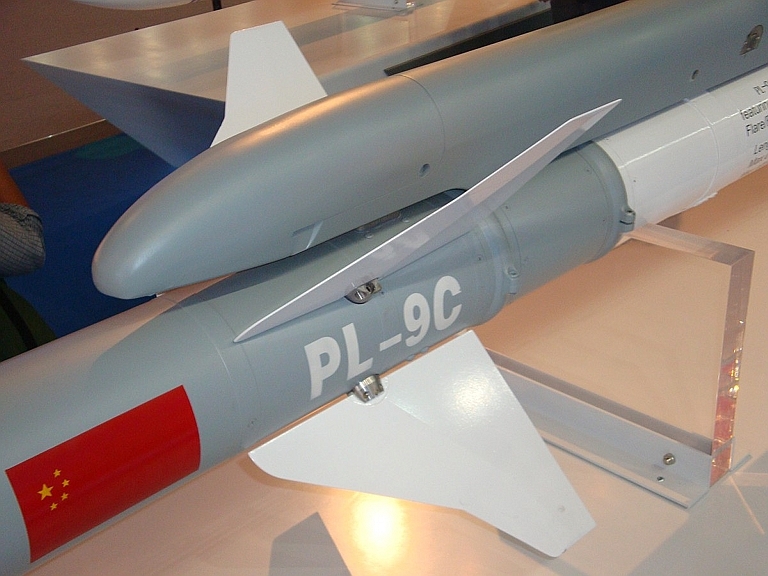 The PL-9 was introduced during the 1990s, and is a separate evolution of the PL-5 series, with capabilities similar to the AIM-9L/M (image © 2009, Zhenguan Studio). The PL-9 is conceptually closest to the AIM-9P and appears to be an evolution of the PL-5 series missile, although Chinese sources claim the missile outperforms the AIM-9L/M. Production status of this missile remains unclear. Detail of the PL-9C displayed at Zhuhai 2008 (image © 2009, Zhenguan Studio). PL-8 Python 3 and PL-11 Aspide AAMs carried by a Chengdu J-10S Vigourous Dragon of the PLA-AF (Chinese internet image). The PL-8 is a legally licenced copy of the Israeli Rafael Python 3 WVR missile, the predecessor to the widely exported and highly agile Python 4. 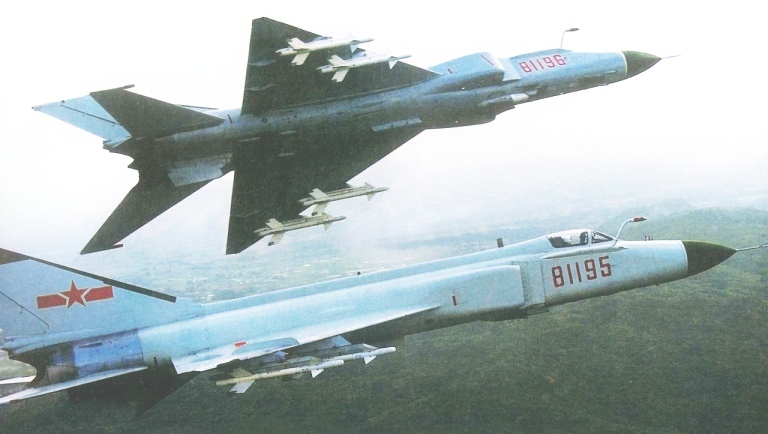 Production of the PL-8 commenced during the late 1980s, five years after initial negotiations, the weapon has been integrated on a wide range of aircraft, including the J-7E Fishbed, J-8B/D Finback and new J-10 and J-11B. 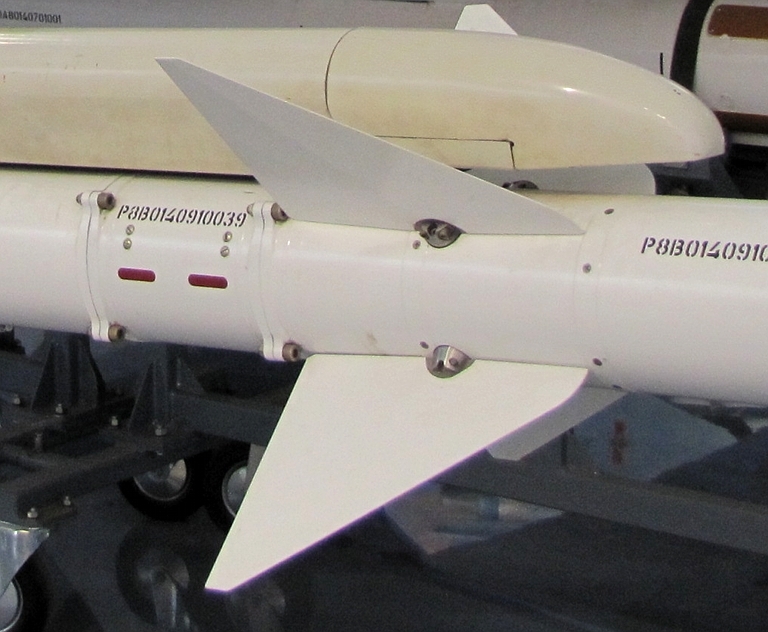 Comparable to the AIM-9L in basic performance, the PL-8 is an all aspect WVR missile designed for close combat, and credited with a 35 G capability. Chinese sources claim it has been integrated with a helmet mounted sight. The Python 3 is credited with between 35 and 50 kills during the 1982 Israeli invasion of Southern Lebanon. PL-8 on display at Datangshan in 2010 (Zhenguan Studio, © 2010, Air Power Australia). PL-8 seeker window. This example appears to be a training round and may not use authentic window materials, the grey colour suggests the use of a Magnesium Fluoride glass for all aspect 4 micron band operation (Zhenguan Studio, © 2010, Air Power Australia). PL-8 canard controls and laser proximity fuse windows (Zhenguan Studio, © 2010, Air Power Australia). PL-8 tail section. The roll stabilisers are concealed by protective covers (Zhenguan Studio, © 2010, Air Power Australia). 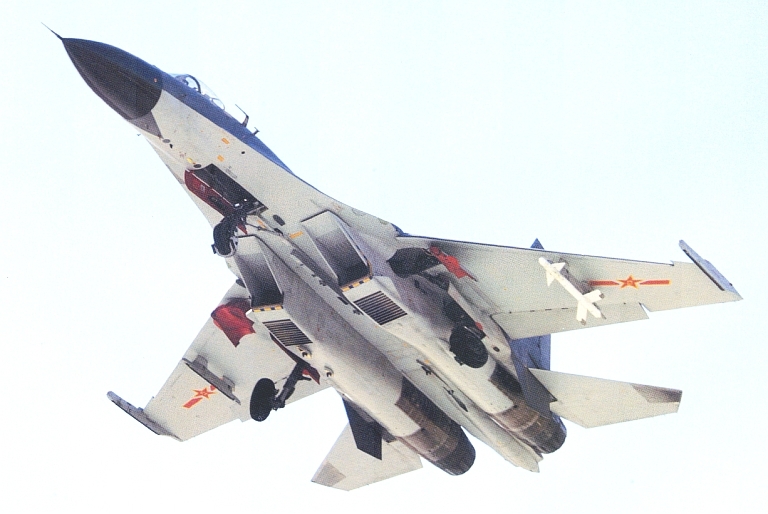 Shenyang J-11B Sino-Flanker with a single PL-8 AAM under the wing. 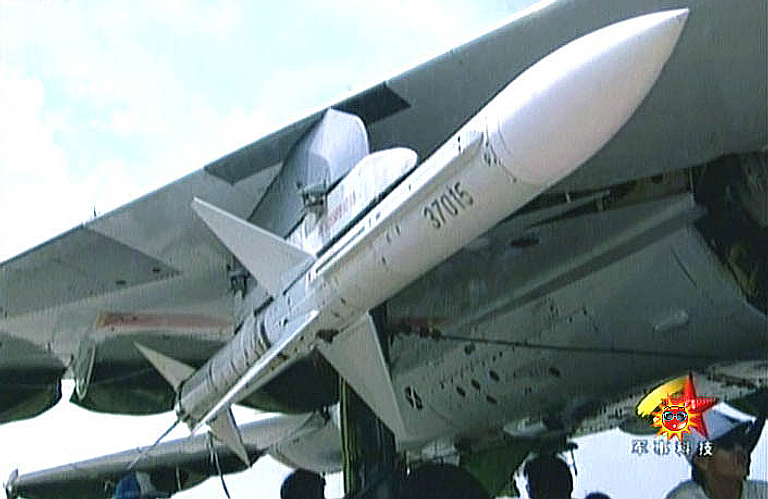 The best indigenous WVR missile in Chinese service is the all aspect PL-8, comparable to the AIM-9M. This weapon is based on a licenced Rafael Python 3 missile. The PL-8 is frequently carried by the large J-8-II Finback interceptor. Rafael Python 3 AAM. The PL-8 is a licenced Python 3. The design has, compared to the AIM-9, long span wings, also with ram driven roll stabilisers (FAB). Matra R550 Magic of the French Navy (French MoD). The PL-7 is a reverse engineered Matra R550 Magic WVR AAM, which entered production during the 1980s. 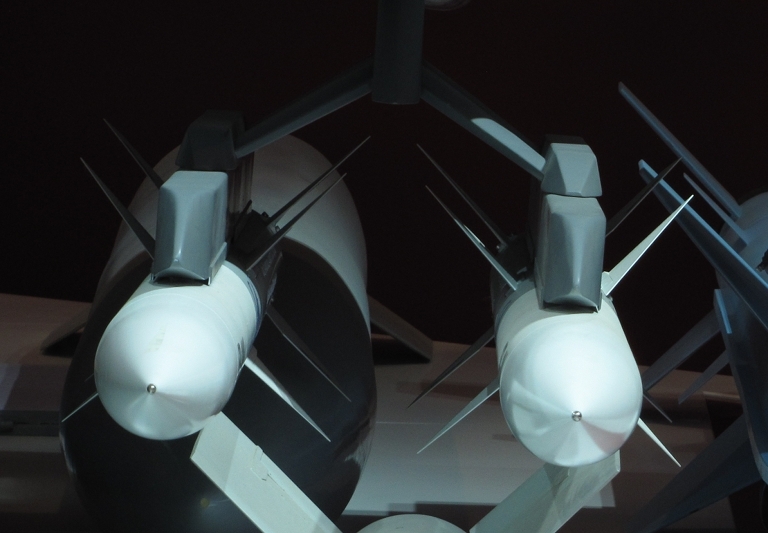 The basic Magic I occupies the same niche as contemporary Sidewinders, but the missile uses a characteristic paired canard arrangement to improve turn rates. The seeker is nitrogen gas cooled using a Joule-Thompson element. While the PL-7 has been displayed at airshows, there have been no reports of significant production numbers or exports. The R550 was exported to India for the Mirage 2000. The PL-5E-II is the latest evolution of the cloned Chinese R-13, and is comparable in configuration to the AIM-9L/M Sidewinders (image © 2009, Zhenguan Studio). The R-3 and R-13 missiles were the first clones of the Sidewinder, based on captured examples of the early AIM-9B. The initial R-3S/K-13A/K-13T) was a direct cone entering production during the early 1960s and widely exported to Soviet clients. A semiactive homing variant, similar to the AIM-9C on the F-8 Crusader, the K-13R/R-3R entered production during 1966. 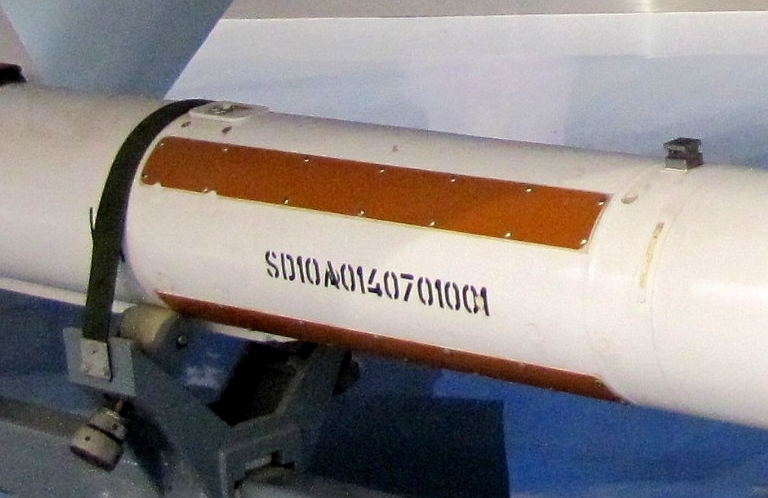 The subsequent R-13M/R-3M/K-13M and improved R-13M1 were introduced during the 1970s, equivalents to the AIM-9G. The Soviet R-13 was cloned by China as the PL-2, which later evolved into the PL-3 and PL-5 missiles. No less than four variants of the PL-5 are identified. The PL-5A was equivalent to the K-13R, but the program was cancelled during the 1980s. The PL-5B did not enter production until the 1980s, despite initial development starting two decades earlier. The PL-5C is an improved PL-5B widely used by PLA-AF and PLA-N units. The latest PL-5E is an attempt to outperform the AIM-9L/M series, using an all aspect seeker, AIM-9L style double delta canards, a 40 degree off boresight capability, and 40G manoeuvre capability. PL-5 variants are used on the J-7 Fishbed, J-8 Finback, FH-7 and Q-5 Fantan, J-7s and Q-5 having been widely exported in Asia. PL-5E-II Magnesium Fluoride seeker window. The choice of material indicates a 4 micron band detector (image © 2009, Zhenguan Studio). PL-5E-II, PL-9C and TY-90 (image © 2010 Air Power Australia, via Zhenguan Studio). Luoyang PL-5E-II on JF-17 wingtip, exported to Pakistan (image © 2010 Air Power Australia, via Zhenguan Studio). Early models of the PL-2, PL-2A above and PL-2B below, were cloned Soviet K-13 / AA-2 Atoll derivatives. The Vympel K-13A is a reverse engineered AIM-9B Sidewinder (Wikipedia image). Vympel K-13A seeker (US DoD). TY-90 short range AAM (image © 2009, Zhenguan Studio). The R-77 was developed as a counter to the AIM-120 AMRAAM, and is often dubbed the AMRAAM-ski. 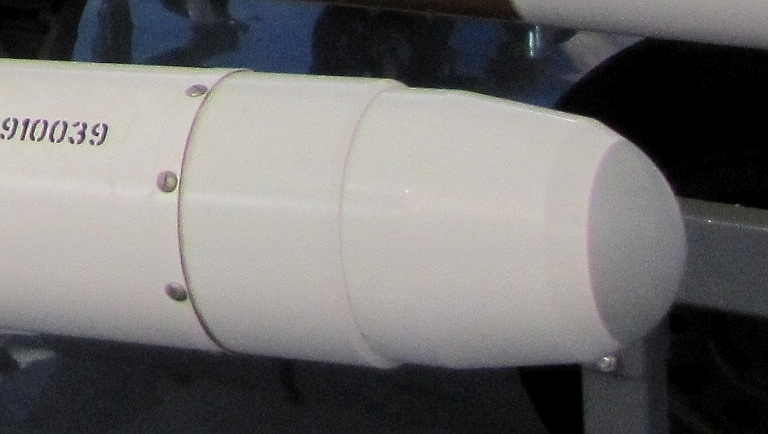 This weapon uses large strakes for lift enhancement, and unique lattice tail controls, derived from an TBM design. Developed during the 1980s, it entered service a decade later on the MiG-29 and Su-27/30 series fighters. The R-77 employs conceptually similar guidance to the AMRAAM, with an inertial unit, datalink uplink receiver and a terminal seeker, specifically the 9B-1348E in the baseline active radar variant. 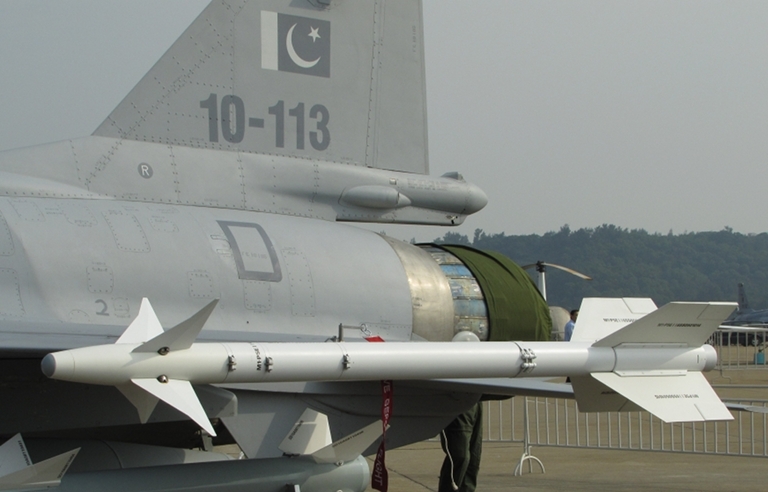 The missile is credited with an A-pole range of 54 NMI, the capability to defeat a 12G target, can be launched at 8 G, and requires an AAKU/AKU-170 launcher. More recently reports have emerged of new seeker options for the missile, following the pattern in the R-27. The R-77T uses an MK-80M seeker from a later model Archer, the R-77P a variant of the 9B-1032 X-band anti-radiation seeker. A rocket-ramjet variant of the missile has been in development since the 1990s, as a counter to the EU Meteor. Designated the RVV-AE-PD, and often labelled the R-77M, this weapon is claimed to achieve an A-pole range of 86.5 NMI. It is unclear what the production status of this model is. Variants of the R-77 have been exported to most current operators of late model MiG-29 and Su-27/30 series fighters, and there are claims the missile may have been licenced by China. 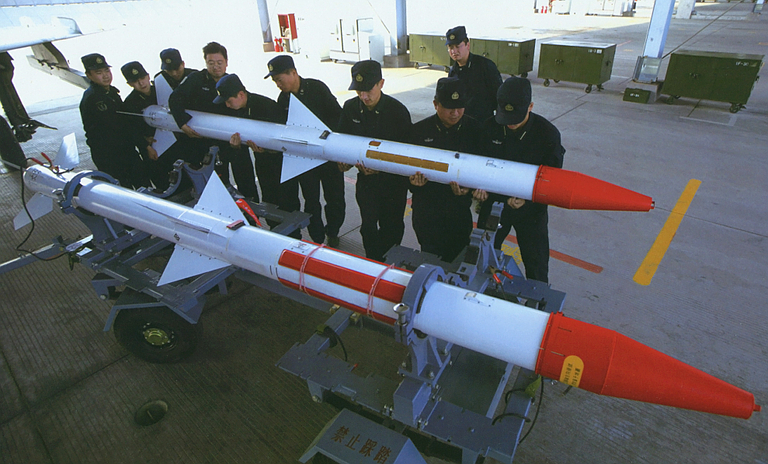 The seeker and guidance package are known to have been licenced by China for use in the PL-12/SD-10 Sino-AMRAAM. The R-60 was superceded in frontline Soviet units during the 1980s by the R-73 missile, at that time the most capable WVR missile in service and the first fourth generation design. The R-73 introduced key design innovations, including thrust vectoring for post launch agility, canard vanes for high turn performance, a gimballed agile MK-80 seeker capable of 45 degree off boresight acquisition, and an interface to the Shchel 3U series helmet mounted sight. 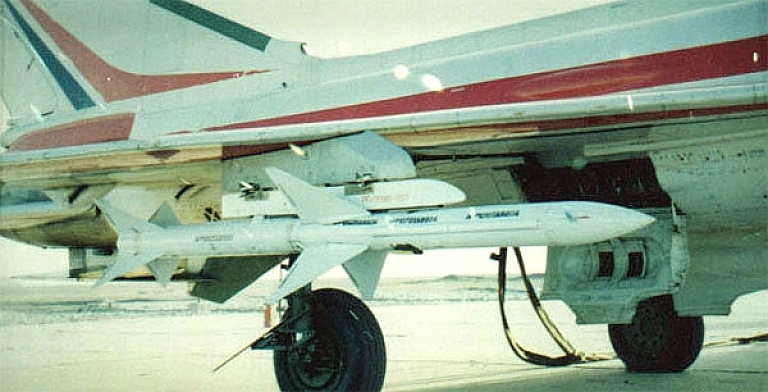 The AIM-9X, ASRAAM and Python 4 were developed to counter the early models of the R-73. 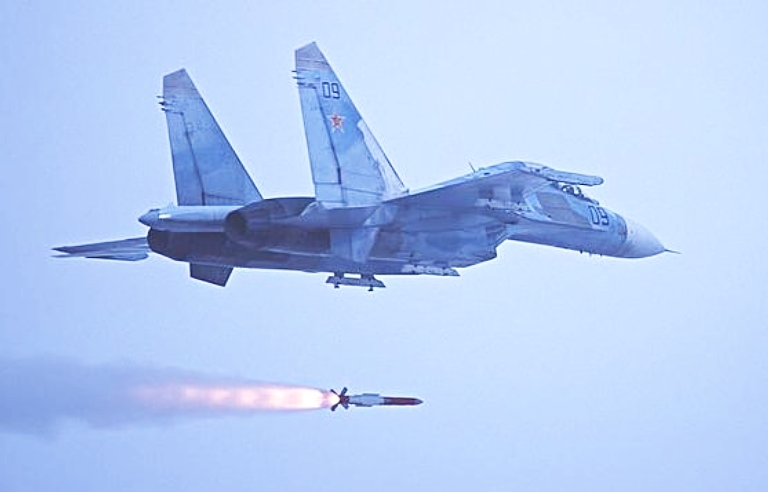 The R-73 has been primarily deployed on the MiG-29 Fulcrum and Su-27/30 Flanker, and is part of the standard weapons kit supplied with either fighter for export. R-73 missiles are carried on APU-73 launchers. The R-73 has further evolved. The R-73EL introduced a laser proximity fuse during the mid 1990s, replacing the radio-frequency fuse in earlier models. The R-73M increased range and improved off boresight capability to 60 degrees. The latest R-74 includes digital processing techniques, and is claimed to have a 75 degree off boresight capability. 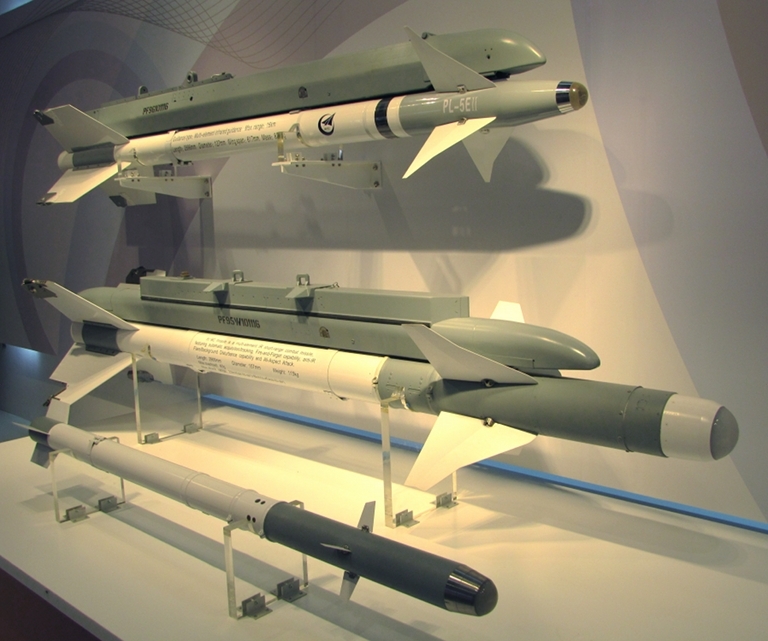 It is likely that future R-74 derivatives will include FPA seeker technology. 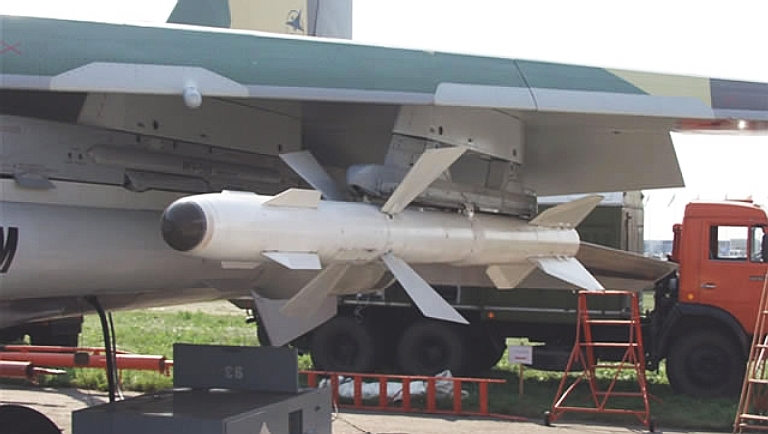 The Vympel R-27 was introduced as a BVR missile to arm the MiG-29 Fulcrum and Su-27/30 Flanker, making it a contemporary to the R-73 missile. Much larger than the competing AIM-7 series, the R-27 outranged the AIM-7 by a respectable margin. Unlike the Sparrow, the R-27 is supplied with two distinct rocket engine configurations, and a range of seekers. R-27 missiles are thus divided into 'short burn' and 'long burn' variants, recognised by the length of the missile fuselage. In terms of seekers, the baseline semi-active radar guided variants are equipped with a 9B-1101K seeker, these being the short burn R-27R1 credited with 43 NMI range, and the long burn R-27ER1 credited with 70 NMI range. These employ midcourse datalink support, but require terminal illumination. The R-27T1 and R-27ET1 employ derivatives of the R-73's MK-80 agile infrared seeker, compatible with a helmet mounted sight. The R-27P and R-27EP employ a 9B-1032 X-band passive anti-radiation seeker, intended to force an opposing fighter to go 'nose cold'. The most recent enhancement to the R-27 series is the upgrade option of fitting an Agat 9B-1103M active radar seeker and supporting midcourse guidance package, based on the 9B-1348E seeker in the R-77. A fully digital derivative of this seeker, with improved acquisition performance, is available, using Texas Instruments TMS320 processing hardware. Upgraded missiles are designated the R-27A and R-27EA. The R-27 despite its size and 1970s origins remains a formidable missile, and with the diversity of seekers possible presents genuine issues for a defending aircraft's countermeasures suite. The weapons is in service with all regional operators of MiG-29 and Su-27/30 series fighters, and Chinese sources claim the R-27P has been sighted on the J-8II Finback. Fisher, R.D. 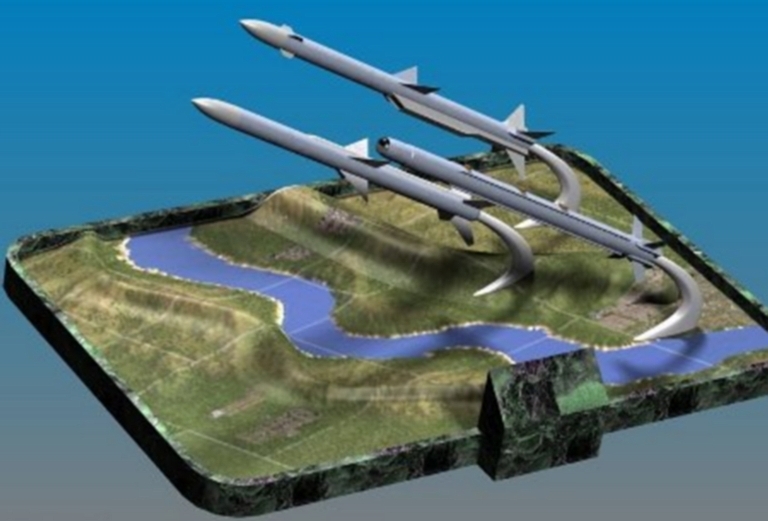 , China’s Emerging 5th Generation Air-to-Air Missiles (Recommended), IASC, Washington, DC. Imagery Sources: Xinhua; PLA-AF; MilitaryPhotos.net; other Internet sources.